Will move into football make New Balance an industry giant? New Balance’s brand has undergone something of a transformation in recent years. Now, company bosses want more. Their ambitious aim is to become a top three global athletic brand. They are targeting the market share of Puma above others, as they see them as a close rival. Is this achievable? And what does YouGov BrandIndex and Profiles data tell us about who they should be targeting? The company has recently undertaken its first foray into the football boot market. The products will be worn by, among others, Arsenal midfielder Aaron Ramsey. This complements the multi-million pound kit supplier deal New Balance struck with Liverpool FC in February. They hope this move will not only boost perception in the UK but also in South East Asia too. The brand has shifted its image over recent years. It has moved from perhaps being the brand synonymous with the dusty set of trainers in the cupboard, to the bastion of hipsters and trendsetters across the country (whilst also maintaining a solid reputation in the running world). YouGov BrandIndex data points to who they are having success with. YouGov’s Purchase Consideration metric measures whether a respondent would think about buying a particular brand’s products. The overall score on this measure has been growing steadily since the Liverpool announcement (current score is +9.8). Among groups that New Balance will target specifically the story is better. 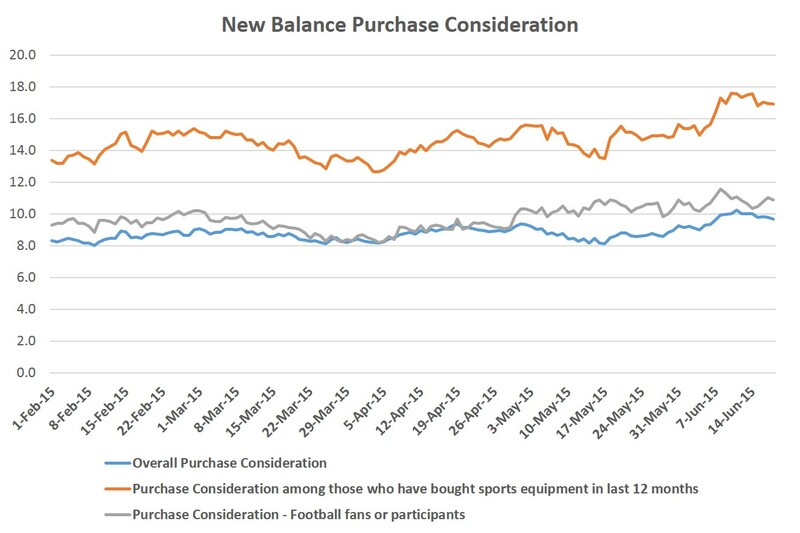 The score when looking at football followers and participants is +11, while among those who have bought sports equipment in the last 12 months, it is +17. YouGov Profiler helps us to see what differentiates customers of New Balance from their comparison set. In terms of demographics, they are male, aged 25-39 and in the ABC1 social grade. Unsurprisingly their favourite sports are athletics and jogging. They also tend to read The Independent and also Men’s Health Magazine, which may point towards where some advertising efforts could be concentrated. Of course, it will be extremely difficult to permeate the hold the traditional behemoths of industry – Nike and Adidas – have on the market. Creative and unique positioning in the football sphere will be key to winning over customers that have built up loyalties elsewhere. With rivals also gearing up for the season ahead, New Balance will have to battle hard for the attention that they will crave.